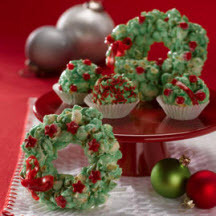 These cute marshmallow and candy popcorn wreaths will add a whimsical touch to a holiday dessert platter of sweet treats. Spray hands with cooking spray and press firmly to form into 9-inch logs and then bend to form ‘wreaths’. Place ‘wreaths’ on wax paper. Press candy decorations onto wreath to decorate; add a ‘ribbon’ cut from fruit leather. Serve immediately or wrap individually in plastic wrap for storage. Add a ribbon tie to plastic wrap, or cellophane, as a decorative closure.